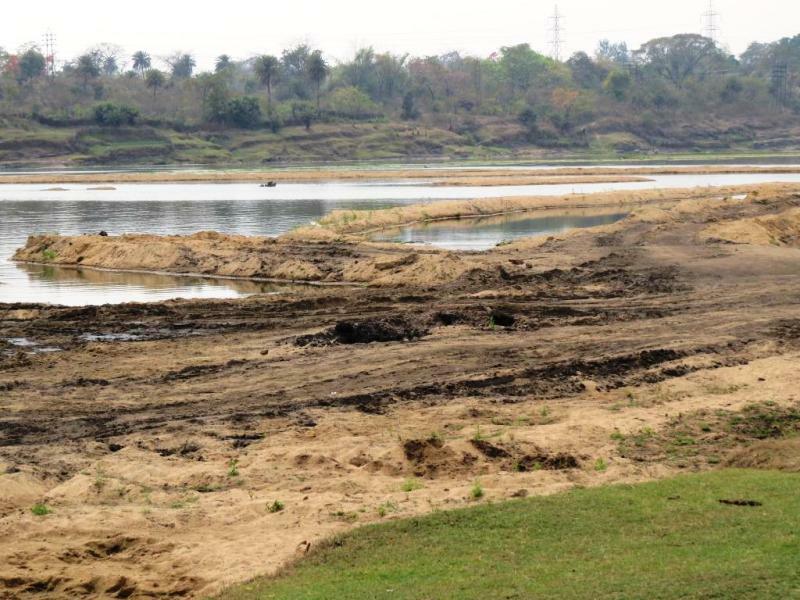 In March 2015, the Jharkhand State Pollution Control Board (JSPCB) issued notices to 23 industrial units for polluting the Damodar river in Dhanbad and Bokaro districts. Prominent among those who received notices are power plants and coal washeries. When one thinks of coal, and pollution related to coal, what comes to mind most often are coal mines or thermal power plants, with mountains of overburden, discharge of mine effluents, coal ash, and smoke laden with suspended particulates. However, the coal washery is an important, if less known component of the coal chain. With the number and capacities of coal washeries likely to go up, it is important to understand the impacts that washeries have. Coal has significant quantities of impurities in the form of ash. Indian coal is of particularly low quality, with ash content ranging from 30-45 percent. This leads to many problems, including lower efficiency of power generation, higher amounts of waste (ash) and increased cost of transportation, as huge quantities of waste material are transported with the coal. Washing of coal is part of the solution to address these issues. Washing – also called coal beneficiation – is a generic term that covers various methods that are used to improve the quality of coal by removing denser material and high ash. Most of these methods are based on the difference in density with the cleaner coal and impurities present, and use large quantities of water. A typical washing process starts with the crushing of coal to reduce it to a suitable size, and then screening to separate the coal into groups of particles with similar sizes. Some of the methods used for washing include dense media separators – where a mix of water and magnetite forms a dense liquid on which clean coal can float and impurities sink, or jigs where a mixture of water and coal is pulsed so that the heavier particles again tend to sink and the cleaner coal floats. The washing process produces “clean coal” – a misnomer clearly, for the clean coal may still have ash content of 18-20 percent even at best. Apart from that, it produces “middlings” with high ash content, and “rejects” with very high ash content. It also produces large volumes of slurry that carry the fine coal dust, impurities and chemicals. The main problem with the washeries is the same as with any washing – the washing process does not eliminate impurities. It just removes them and separates the “clean” and the “dirty”. Indeed, with the clean coal being taken away, the impurities remain behind, and thus, washeries can well be looked upon as concentrating the dirt and impurities! This is certainly the picture that one gets in Dhanbad. Dhanbad, and the neighbouring areas have some of India’s earliest coal mines. As is well known, many of the mines around Dhanbad and Jharia have been on fire for decades now, if not more. The area also has several thermal power plants and a large number of washeries. This has resulted in the region being one of the most polluted in India – with dust and smoke from the mines, from coal transport, overburden of the mines, ash from power plants, and the effluents and rejects from washeries. Conveniently for them, many of the washeries are located on the banks of the once beautiful and bountiful Damodar river and slurry from the washeries has been flowing freely into the river. Moreover, washeries have been dumping the rejects along the river banks. With mines also often dumping their overburden (the rock and soil that is removed to expose the coal seam) along the river banks, all sorts of silt and leachates flow into it. 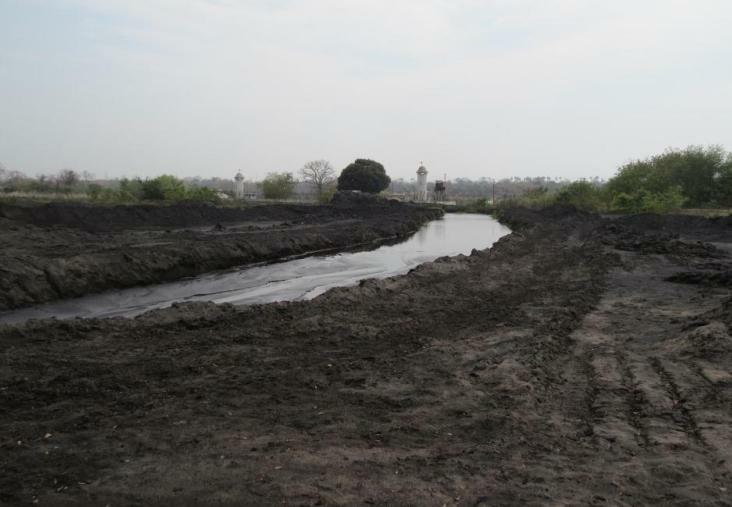 In 2009, the Ministry of Environment and Forests declared Dhanbad one of the “Critically Polluted Areas” in the country, based on a Comprehensive Environmental Pollution Index (CEPI) and in January 2010, imposed a moratorium on environmental clearance for new industries in the area. It also noted that “The rejects of the coal washeries are the main problem. They are dumped,” and recommended that rejects should be removed from the river bed and its proximity and disposed of through sale or utilisation. The problem is that while the rejects can be utilised for burning, even in power plants with specialised boilers, they will produce huge amounts of ash as the impurity content is very high. The coal washery capacity in Dhanbad region in 2012-13 was close to 38 million tons of raw coal utilisation, as per the Coal Directory 2012-13 of the Ministry of Coal. With about 20 percent of the feed resulting as rejects, the washeries would generate about 7.6 million tons of rejects every year if operated at full capacity. In 2012-13, these washeries used about 15 million tons of coal, and this would have produced about 3 million tons of rejects. These are virtually being dumped near the river, year after year. Apart from the rejects, the washeries produce massive quantities of coal slurry. This is due to the fact that most of the coal washing is done through wet processes using water. In theory, as per environmental stipulations, these coal washeries are supposed to be “zero discharge.” However, this has been the exception rather than the rule. In spite of these and many other persistent problems, the MoEF removed the moratorium from Dhanbad area in September 2013, saying that the CEPI index was decreasing. Yet, this seems far from the reality. A recent visit by this author to the area showed that many of the serious environmental problems continue. Dust was everywhere. 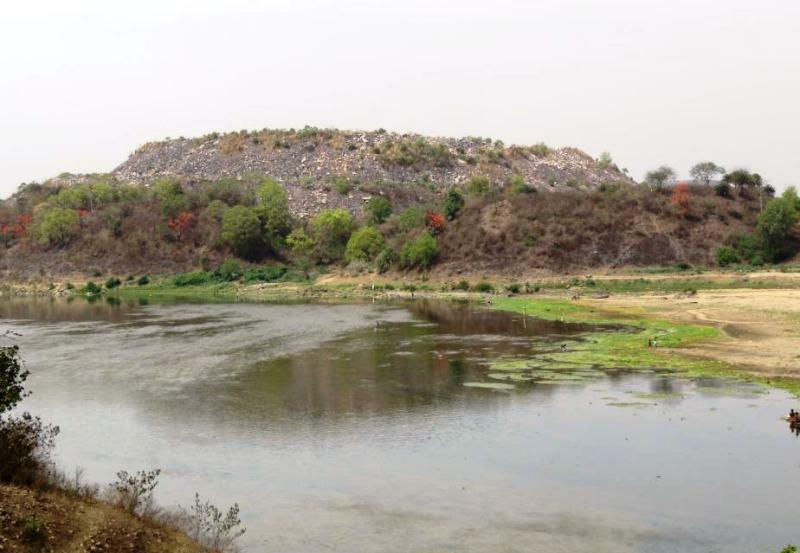 The banks of the rivers had huge dumps of overburden. Washeries continued to discharge coal slurry into the Damodar river. It is little wonder then, that the JSPCB was forced yet again to issue notices in March to 23 industries including power plants and washeries in the area. However, it’s not clear whether this is a serious initiative by the JSPCB to rein in the pollution or whether it is just another round of “show” where the Board issues notices and creates an illusion of action being taken, following which things go back to the usual once again. While some coal washery operators told this author that there was a lot of pressure on them from the pollution control board to control the slurry discharge in particular, there is reason to be cynical because in the last several years, such notices have been issued many times to the industries in the area; yet the problems seem to remain the same. Another worrying issue is that while there are numerous requirements for extensive monitoring of air, land and water pollution on a regular basis – as a part of regular pollution monitoring and especially for environmental clearances in a critically polluted area – little of this data is available in the public domain. The sketchy data that is available is often not current. Moreover, even when common people can see and feel the pollution, the figures from such official monitoring mostly show that all pollutants are within norms of acceptable limits. All these raises questions about the “accuracy” of the data. Further, tucked away in a small corner is an inconspicuous link titled ‘NGT Order Display’. In an order dated 29 October 2014, relating to the pollution of Ganga, the National Green Tribunal ordered that the Ganga basin states, including Jharkhand would put up on their websites the list of all seriously polluting industries which are discharging their effluents into the Ganga or its tributaries. This would have to include industries that have not installed anti-polluting devices, and industries which may have installed such devices but where these devices are not working. The Damodar is considered a part of the Ganga basin and hence Jharkhand has to report on its status too. The link on the JSPCB website opens a file that lists many industries, towns and cities. This includes a list of 94 industries, discharging effluents to the Damodar or its tributaries, ”mostly all “seriously polluting” ones, and has most of the coal washeries, collieries and thermal power plants in it. This is a clear acknowledgement that even today, most of the run-off and leachate from all the pollution is ending up into the Damodar river. The continuing pollution from mines, power plants, and coal washeries in the Dhanbad area is a warning, both for the region and other areas. This is because a massive expansion in all the three operations is on the cards in Dhanbad as well as other parts of the country. In particular, the washery capacity is expected to go from 126 million tons per year to 224 million tons per year in the 12th Five Year Plan, and that is when you count only additions by the public sector, excluding proposed additions by the private sector. This indicates how sharply the levels of pollution are likely to rise. As the picture in the Dhanbad area shows, we are not even able to manage the pollution at the existing levels. The current experience inspires little confidence in either the willingness or the capacity of the existing machinery to address the issue.